GALLUP – The 2015 New Mexico-Tribal Gaming Compact is the focus of a meeting between U.S. Interior Secretary Sally Jewell and the Navajo Nation, the Jicarilla Apache Nation, Mescalero Apache Nation, Pueblo of Acoma and Pueblo of Jemez in Washington, D.C., May 14. That’s according to Navajo Nation Council Speaker LoRenzo Bates. Bates said on Tuesday that the tribal gaming compact was submitted to Jewell for her 45-day review and approval on April 20. He said that the May 14 meeting is to insure that Jewell approves the compact. It took the Navajo Nation three years of negotiations and the unexpected but welcomed addition and support of two tribes and two Pueblos before the New Mexico State legislature approved the 2015 gaming compact for the Navajo Nation on March 11 and one month for Gov. Susan Martinez to sign it on April 13. 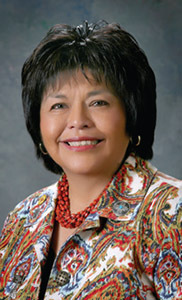 The introduction of the gaming compact by New Mexico State Rep. Sharon Clahchischilliage, R-Kirtland, definitely helped. 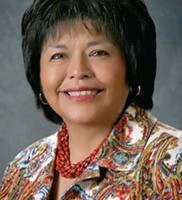 The current gaming compact for the Navajo Nation, which was approved in 2007, expires on June 2015. The state legislature adjourned on March 21. Clahchischilliage said it was fortunate that the governor signed it. She explained that the compact took three years of negotiations because a lot of casino tribes were concerned that some of provisions in the proposed compact for the Navajo Nation would impact them. The other gaming tribes and Pueblos wanted the Navajo Nation to have a compact like them but the Navajo Nation is not like the other gaming tribes and Pueblos, she added. For example Clahchischilliage said the casino locations of other tribes and Pueblos are in metropolitan areas. The official legislative title of the 2010 compact is SJR 19 or Senate Joint Resolution 19. Clahchischilliage said that a Republican majority in the House also definitely helped. She explained that last year, the Democrats were the majority and so the chairperson and vice chairperson of the Compact Committee were Democrats. She added that the House worked really hard to get supporting votes for SJR 19 in the Senate, where the Navajo compact died in the Senate. The Senate passed SJR 19 with a vote of 35 in favor and 7 opposed. According to a summary of the 2015 compact, the revenue sharing would be 9 percent for the first three years, 10 percent for the next 12 years, and 10.75 percent for the last seven years. The revenue sharing for the 2007 compact is 9.75 percent for year one, 10 percent for the next 15 years, and 10.75 percent for the last 7 years. The Free Play provision, which both Bates and Clahchischilliage as the most controversial part of the 2015 compact, removes the 2007 compact’s restricted use of free play, which increase revenue sharing for tribes and limited the amount of free play that could be offered. Under the 2015 compact, free play is determined by a formula that meets the standards and ethics of Generally Accepted Accounting Principles and the American Institute of Certified Public Accountants. The 2015 compact also has an internet gaming provision, which would allow the five tribes to reopen compact negotiations if the state authorized internet gaming. The 2007 compact didn’t have a provision for internet gaming and it also limited tribes with compacts to two Class III gaming facilities. Under the 2015 compact, the five tribes are allowed to operate four Class III gaming facilities but tribes must identify the fourth facility by June 30, 2015. The location of the fourth facility can be moved once within a 15 mile radius. And the 2015 compact would not limit the tribal operation of Class II gaming. Regarding criminal jurisdiction, the 2007 compact lacked tribal jurisdiction over non-Indians. But the 2017 compact expands criminal jurisdiction over non-member Indians under the Duro Fix and over non-Indians under the US Violence Against Women Act. And disputes can now be settled in tribal courts. Insurance policy amounts also changed from $50 million in the 2007 compact to $10 million in the 2015 compact. But state regulatory fees increased from $121,000 in the 2007 compact to $182,000 in the 2015 compact. And under the 2015 compact, the state’s representative may inspect, verify and obtain copies of gaming facility records. The 2015 compact also removes a 2007 compact prohibition for the operation of any Class III gaming facilities for at least four consecutive hours daily, Monday thought Thursday, which allows tribes to operate Class III gaming facilities 24 hours/day, seven days a week. Another 2007 compact prohibition that was removed was tribes providing complimentary lodging or food to patrons at no or nominal charge, except through a players’ club program. The 2015 compact allows tribes to offer complimentary food and lodging up to 3 percent of the gross gaming revenues and to continue operating their player club programs. The 2007 compact prohibition against tribes allowing a line of credit to certain patron was also removed. Under the 2015 compact, tribes may only offer certain individuals that meet certain criteria, such as sufficient liquid assets, a minimum line of credit of $10,000. Tribes are also no longer required to report campaign contributions under the 2015 compact, which is in the 2007 compact. A 2014 compact provision that was removed in the 2015 is the transfer of jackpot winnings to the State Department for patrons who won more than $2,500 in jackpots and owed child support payments.